A talented and experienced intelligence and security professional who combines nearly a decade of expertise with relevant academic qualifications. Grounded solidly in a background of computing and social science, Stewart presents a professional customer facing offering, that mixes technical skill with a transparent and easily accessible research methodology. The case of the Syrian Electronic Army (SEA) offers the chance to study a counter response to the cyber activism of the Arab Spring. Research methods featured an adapted method of snowball sampling. The main technical finding of the study placed the SEA within two degrees of separation from a senior politician within the Assad regime. The core conclusion of the paper is the definition of a ‘close enough’ relationship between the SEA and the Assad regime, defined as distant enough to preserve plausible deniability but close enough to ensure the strategic alignment of the SEA to state policy goals. In 2016 the United States (US) Federal Bureau of Investigation (FBI) added two alleged members of the Syrian Electronic Army (SEA) computer hacker group to its cyber ‘most wanted’ (FBI News, 2016) list. The FBI justified the listing by stating that the two individuals had, as part of their involvement in the SEA, through their actions “…provide[d] support to the Assad regime” and, in so doing, “sought to harm the economic and national security of the United States in the name of Syria”. This event was highly significant for a number of reasons; firstly, the two SEA members were the first politically motivated hackers (hacktivists) to be named on the most-wanted list, and secondly, the US legal charges and FBI manhunt signalled the tangible international and political impact that the SEA had achieved through its activities. The actions of the SEA have doubtlessly been provocative; however, many questions remain unanswered. One concerns the formality of the relationship between the SEA and the Assad regime. Varying opinions have developed, ranging from labelling the group as an outright proxy force for Assad (Al-Rawi, et al 2014) to labelling its members as little more than amateurs and an adjunct to the wider Syrian conflict (Motherboard, 2013). Although this paper deals directly with the evidence that attributes the SEA to the Assad regime, the research takes a perspective that is different from the usual ‘proxy or not?’ debate, rejecting this binary approach for a more suitable investigation of the data. The paper outlines the strategic logic behind the SEA as a group distant enough from the Assad regime to provide plausible deniability, but close enough to interpret and meaningfully pursue state political goals in cyberspace. This relationship is the proposed as a ‘close enough’ relationship between a non-state cyber group and a state authority. From this base the paper considers the strategic advantage to both state and group when engaged in a cyber counter-insurgency (cyber-COIN) style of conflict. The remainder of the paper comprises a review of insurgency/COIN studies and US military thinking on aspects of cyber warfare, followed by a brief explanation of the qualitative research method. The core of the paper is an in-depth analysis of a previously overlooked aspect of the available data that illustrates the close enough nature of the relationship between the SEA and the Assad regime. The paper concludes with an analysis that fuses the conclusions of the previous sections with wider COIN theory. Conflict-driven human interaction within cyberspace has been a growing focus of academic study for a number of years. Early investigations into cyber intrusions of such victims as the Office of His Holiness the Dalai Lama in 2007 (Information Warfare Monitor 2010), and theorization about cyber attacker methodologies, (Caltagiron et al, 2016 and Hutchins et al, 2016) paved the way for an entire sub-section of the cyber security industry. They also led to serious academic study into the phenomenon of computer hacking. Contiguous to this development within the private sector and academic sphere, the US military, led predominantly by the US Air Force, theorized about the shape of military operations in cyberspace. A major output of this process was the recognition of cyberspace as the ‘the fifth domain’ (Robert, 1996) of military operations. This categorisation heralded the development of sub-categories of military operations in cyberspace, such as Computer Network Operations (CNO), Computer Network Attacks (CNA) and Computer Network Defence (CND). Each of these classifications has unique characteristics, and from this observation it is obvious that there are differing conceptualisations of the forms that state power projection into cyberspace can take. Operations range from high-tech, ultra-covert cyber espionage (the so-called Advanced Persistent Threat) to much less technical but much more public displays of power (Russia’s so-called web brigades, Веб-бригады, or the ‘Troll Armies’, for example (Polyanskaya et al, 2003)). Within this scale of state capabilities, at the technical ‘softer’ social media enabled pole of the scale, there is often the observable social dynamic of two opposing groups competing to shape the behaviour and actions of a target audience. The classic actor relations thus emerge among insurgent, counter-insurgent and the target audience they are attempting to influence (Taber, 1965). Within this actor tri-graph the idea of a cyber insurgency as a stand-alone concept is observable developing within the post-9/11 US military as early as 2011 (Hagestad, 2011 and 2013). The core idea seeming to underpin this concept is that COIN warfare in physical space did not just bare a passing resemble to some emergent conflicts in cyberspace; instead, that COIN doctrine could be directly applied to the fifth domain because the doctrinal axioms underpinning cyber and physical insurgencies are one and the same. Although still awaiting enshrinement in official military doctrine, the concept of ‘cyber-COIN’ was effectively recognised as a valid concept by the US military in 2015 with Duggan’s work (Duggan, 2015). He proposed the idea of ‘Counternetwork COIN’ and defined the tactic as employing “nontechnical attacks against people to manipulate their perceptions, behaviors, and actions” (Duggan, 2015: 50). The existence of such a thing as cyber-COIN is supported by scholars such as Rid, who commented:“…the new Web, in an abstract but highly relevant way, resembles — and inadvertently mimics — the principles of subversion and irregular warfare” (Rid et al, 2009: 2). Turning to the Syrian conflict, a number of scholars have examined the cyber element through the insurgent/COIN/target audience framework that underpins cyber-COIN, without explicit reference to the concept. Very few of these papers critically examine the nature of the relationship between the Assad regime and the SEA, thereby undermining much of their arguments with assumptions about the nature of the relationship. Shehabat’s work (Shehabat, 2011) categorises all actors within the Syrian conflict into three broad categories: ‘[Syrian] State versus foreign organizations,’ ‘[Syrian] State versus individual’ and ‘foreign organizations versus [Syrian] State.’ However, this omits the ‘non-state pro-Assad actor’ category, within which the SEA may conceivably fit. To ignore the specific aspects of the Assad/ SEA relationship is dangerous, given both the rising importance that cyber conflict is playing in international relations, and the nuanced complexities of the relationship between a state authority and proxy force that have been shown to exist outside of a cyber context through studies of groups such as the US Minutemen movement (Shapira, 2013). When attempting to understand the importance and complexity of the issues of the state/non-state proxy actor relationship an unusual but potentially useful case study has arisen with the context of the relationship between the famous US actor Steven Seagal and Russian Federation president Vladimir Putin. After an extended friendship, Putin recently bestowed Russian citizenship upon Seagal, commenting that the gesture “might be a sign of the gradual normalization of relations between our countries” (Roth, 2016). His comment shows that his relationship with Seagal can be seen (by Putin, at least) as having some influence on the relationship between the US and Russia. Although Seagal’s actions may mirror the warmer sentiment and conciliatory air towards Russia coming from US President Donald Trump (Rozsa, 2016), it is a mistake to naturally assume that Seagal is, by default, a legitimised and official arm of US foreign policy. As curious as the case study is, the dynamics between state and proxy force that the case highlights are as applicable to the relationship between the SEA and the Assad regime. It is this dynamic, seated within a cyber-COIN framework, which the remainder of this paper examines. The core topic of study for this paper is the nature of the relationship between the SEA — as a group and as individual members — and the Assad regime. By necessity, addressing this issue has required an attempted attribution of SEA activity to the Assad regime. Although there are suggested frameworks for actor attribution within a cyber context (Rid et al, 2014), there is scant publically available information on the SEA of the type required to apply such models. Given that this data is unlikely to become available to researchers in the near future, a broad approach to gathering qualitative data from unconventional sources has been used for this research. Annex A of this document provides an overview of the main data source categories used. The researcher acknowledges that most data presented in this paper is circumstantial and susceptible to error. The justification for the approach to data collection is that no single publically available data source provides a foundation to support the theoretical goals of the research. In defence of this position, most, if not all, academic and cyber security industry publications on the SEA are based on similar data sources, often without acknowledgment of the potential risks of using them. The caveat that all source data included in the paper, although critically assessed to the best of the researcher’s capabilities, was ultimately accepted in good faith; it is assumed that sources have not actively tried to deceive or present falsified data. All results are transparently presented, with extensive footnotes, to allow the reader to accurately source the data and reconstruct the analysis used within the report. In an attempt to manage analyst bias Heuer’s Analysis of Competing Hypotheses (ACH) method (Heuer, 1999), along with the weighted scoring method implemented within the Parc ACH software (ACH2.0.5 Download Page, 2016) was used to analyse five separate hypotheses around the relationship between the Assad state and the SEA. These hypothesis and results are presented in Annex B, along with the source of each item of data. The collected data has been analysed in several ways, including a timeline analysis of the SEA’s activities (Annex C) and a modified form of Social Network Analysis used to assess the SEA’s email links to the regime. The specific modification was for the graphs to show only communication from a single individual to a wider network, as opposed to direct communication within a network. Where necessary, a native bilingual Arabic/English speaker has been employed to verify translated text. Although it is certain that the SEA is staunchly pro-Assad, the formality of its relationship to the regime remains deeply ambiguous. Even the SEA itself, in its early form, seemed unsure of its position on this issue; the group claimed to be an official arm of the pro-Assad Syrian state in the very first iteration of Syrian-es.com (IntelCrawler, 2014), only to retract the statement a short time later (IntelCrawler, 2014). This on-again/off-again nature of the SEA’s approach to the relationship typified much of the group’s early communications; however, in later years the group has adopted a policy of routinely denying any formal connection to the regime (Keys, 2013 and Katerji, 2013 and Ferran, 2013). Of course the SEA’s public denial of a connection to the regime does not automatically separate state and group, especially given the SEA’s involvement in activities that it defines as ‘counter terrorism’ (Cameron et al, 2013). An inadvertent attempt to clarify the Assad/ SEA relationship lies within thewithin wording of the FBI’s ‘cyber most wanted’ list and the varying ways relationships are described, when comparing the listing of the SEA members and a separate group of Iranian hackers. The carefully worded listing for the SEA describes its actions as ‘in support of the Syrian regime’ (FBI, 2016a, 2016b,) rather than hacks on behalf of the Syrian regime (FBI, 2016c). This nuanced use of language by the FBI is deliberate, as demonstrated by the more explicit language it uses to link official organisations of the Iranian state to a separate group of cyber activists on the list (FBI, 2016c). The difference in wording strongly suggests that the US government has, at least, recognised the ambiguous nature of the relationship between the Assad regime and the SEA. Even a cursory examination of both the way the group describes itself and the way it is described by third parties, shows that a deeper examination of the available data is necessary when considering an attribution of the SEA to the Assad regime. Although the above statement is built from facts, the presentation of these facts is misleading. Noman relies on implication of their potential meaning over critical analysis of their actual meaning. Others seem content with the implications of a connection between the SEA and the SCS (Grohe, 2015) while others such as Shehabat, go further and conclude that the SEA is an arm of the “embattled regime’s intelligence service” (Shehabat, 2011: 6), by incorrectly asserting that the “Mukhabarat” (Syrian military intelligence) owns the SCS (Shehabat, 2011) and that hence the SEA is in effect an adjunct government entity due to its connection to the SCS. A possibly more meaningful analysis moves away from Assad’s relationship to the SCS and what it may imply about the SEA, while still acknowledging the importance of the role of the SCS as the sole state-backed provider of Syrian web domain hosting services. Given that the SEA’s main website (http://www.syrian-es.com/ or “Syrian-es.com”, which is currently offline) is hosted by SCS-NET, the arm of the SCS tasked with internet service provision (ISP) and all “es” domain name registration in Syria, the Syrian state appears to be providing, in effect, a cyber safe haven for the SEA. The SCS is a pro-Assad arm of the Syrian government, and the group and all of its ISP infrastructure have been controlled by pro-Assad forces during the conflict. Given these facts, the uninterrupted presence of content on Syrian-es.com for at least three years suggests a relationship that goes beyond mere acquiescence of the state towards the SEA; it suggests material support of the SEA from the state. The most obvious counter argument to this assertion is that that the regime is simply not aware of the existence of Syrian-es.com, or even of the SEA. This is unlikely, given the early exposure the SEA received in the domestic pro-Assad media (Noman, 2016) and a speech Assad gave in 2011(O’Brien, 2011). In that speech he stressed the validity of cyberspace activity in the wider context of the Syrian conflict, and came close to directly name-checking the SEA. A final observation that supports the theory that the Assad regime is deliberately choosing to allow the SEA to operate out of a digital safe harbour is that the regime, as a body, has been extremely successful in regulating internet content in Syria, periodically blocking access to such services as YouTube, Twitter and Facebook (Shehabat, 2011), and routinely removing opposition websites from the es space. This demonstrates a granular awareness of the content of the es space by the Assad regime, and in turn implies a deliberate decision to not remove the SEA content. Although the persistence of Syrian-es.com does not go so far as to prove the SEA is, as some have claimed, a “state-supervised” (Gallagher, 2013) organisation, it does show that the Assad regime is, at the very least, adopting a highly biased ‘blind-eye policy’ towards the group. The insight that can be drawn from the Assad regime’s approach to the SEA website is that the group is closer to the regime than the standard Internet user; however, there are other pieces of data available that may add clarity to this assessment. A potentially useful example arose in July 2012 with the WikiLeaks release of the Syria Files (WikiLeaks, 2012), a trove of email messages stolen by hackers from multiple members of the pro-Assad regime. It contained more than two million messages spanning August 2006 to March 2012. Given the volume of communication, the date range, the representation of prominent regime figures in the files, and the Assad regime’s previously demonstrated lack of discretion in regards to secure communication, this data is an obvious source to examine for evidence of a more tangible SEA connection to the regime. Various commentary on the SEA has identified the presence of the tiger.tiger248 address within the Syria Files, and speculated that it may link the SEA to the Assad regime (IntelCrawler, 2014). However, this assessment accepts, at face value, the WikiLeaks claim suggested by the data set’s presentation: that all the email addresses in the Syria Files are directly related to the pro-Assad Syrian regime. Upon deeper investigation, it becomes apparent that tiger.tiger248 was the addressee on two messages, both from gk005@hotmail.com (‘gk005’). The first message commented on the mostly non-violent nature of anti-government protests (WikiLeaks, 2012a). The other detailed the Assad regime’s attempts to find a non-violent solution to the conflict. Although the intended meaning of the messages is difficult to discern without further context, they appear to be relatively bland, propaganda-style press releases aimed at supporters of the Assad side of the conflict. The gk005 address has been attributed by the researcher to an individual named Ghaleb Kandil (he cites it as his contact address on Facebook (Kandil, 2016)). Kandil is a Lebanese mainstream journalist (translated career biography included in Annex D) who has been responsible for a number of pro-Assad news reports since the start of the conflict. The WikiLeaks Syria Files database revealed seven messages from or to gk005, including the two sent to tiger.tiger248. Of the fifteen addressees included within the seven emails, only two appear to be obvious Syrian government email addresses. The others are webmail accounts, such as Gmail and Hotmail, which reduces their diagnostic value for attribution to the Syrian regime. The two Syrian government email addresses that gk005 had communicated with are profiled as follows. n.kabibo@mopa.gov.sy — gk005 only sent one message to this address, which was actually defunct when the message was sent, on 16 April 2011 (shown by an email delivery failure message dated 18 February 2010 (WikiLeaks, 2012b)) (WikiLeaks, 2012c). From the analysis of other messages from and to this address, the account appears to have belonged to a junior Ministry of Presidential Affairs official named Nizar Kabibo. Kabibo’s job seems to have been coordinating visits by foreign journalists to Syria, as assessed from messages sent by such organisations as Sky News, which informed the recipient of upcoming foreign coverage of Syria and Assad (WikiLeaks, 2012d). minister@moi.gov.sy — gk005 sent five messages containing pro-Assad content, in a similar thematic vein to the messages sent to tiger.tiger248. This is most likely a generic Syrian Ministry of Interior address (possibly harvested from the contact form on the Syrian government home page (Syrian Ministry of Interior Home Page, 2016)) to which gk005 may have been sending pro-Assad news articles for comment. Useful in further defining Kandil/gk005’s relationship to the Assad regime is the analysis of a separate 2012 dump of Assad’s personal email account (Booth et al, 2012). 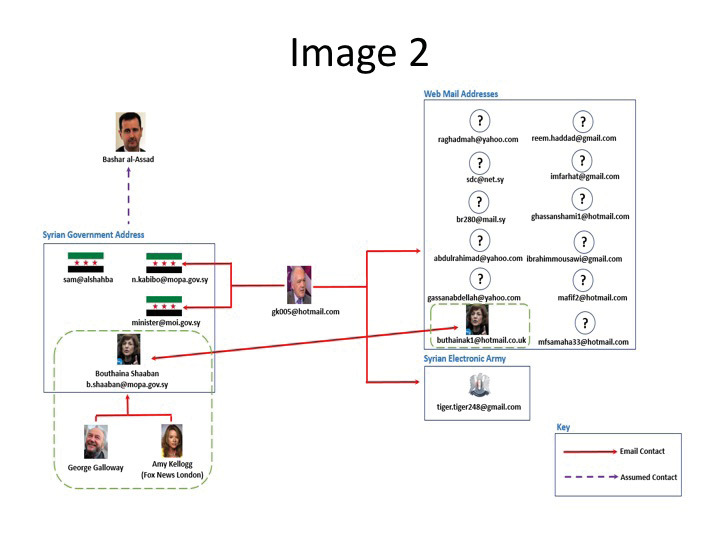 From this trove two individuals (Sheherazad Jaafari and Hadeel al-Al), sharing one email address (sam@alshahba), were identified as key personal advisers to Assad on mainstream media management and the regime’s approach to social media. Within the Syria Files there are no examples of communication between the sam@alshahba address and either gk005 or tiger.tiger248. This further distances gk005 and the SEA from the core inner circle of the Assad regime. A graphical representation of the relationship between the tiger.tiger248 address and the Syrian government address is shown in Figure 1, for clarity. The analysis presented in Figure 1 demonstrates that even a claim of loose association between the SEA and the Syrian authority is shaky, at best, if based solely on the presence of tiger.tiger248’s email address in the Syrian Files. The most that can be claimed is a third degree of separation between the Tiger persona and a defined figure linked to the Assad regime, and even this is charitable — under some social network analysis frameworks, the fact that the n.kabibo@mopa.gov.sy address was defunct at the time of gk005’s message would classify the relationship as having no connectivity value whatsoever (Figure 1 is intended to show communication attempts by gk500, rather than a bi-directional communication network). Compounding the issue of the relevance of the gk005 persona is the very short date range the seven email messages cover; one was dated 16 April 2011 and the other six were sent from 5 to 14 July 2011. These observations regarding the tiger.tiger248 address, combined with the absence of any other address linked to the SEA in the Syria Files, are far from linking the SEA to the Assad regime. Instead, they place it on the very peripheries of the regime, and paint a partial picture of a group maintaining loose links to regime outliers. This assessment stands in stark juxtaposition to the assessment around the Assad regime’s indirect but overt support of the SEA through their inaction around the SEA’s presence within the es web space, and paints the picture of a state backing a group but without apparently communicating with it. While it is possible that this communication between state and group is simply not observable, this is unlikely given how senior members of the Assad regime have shown to be communicating across the spectrum of the pro-Assad government apparatus in both the Syria Files and 2012 data leeks. Instead the researcher would propose that the evidence points to an alternative form of relationship between the SEA and the Assad regime. In the absence of a ‘smoking gun’ piece of evidence that conclusively links or fully separates the Assad regime and the SEA, a picture emerges of a loose connection between state and group, the ‘close enough’ relationship proposed by this paper. Within this relationship are strategic incentives for both parties to keep the SEA at a distance from the regime, preserving deniability, while keeping them closer than the average Syrian to maintain the group’s acquiescence to Assad policy. When viewing the available data through this lens a more satisfying picture of state and group relationship emerges. Indirect contact with the regime through individuals, such as Ghaleb Kandil/gk005, and pro-Assad media organisations, such as http://documents.sy/ (attributed by a 2014 data breach of the site), places the Tiger persona close enough to the regime to be cognisant of the desired direction of the pro-Assad media narrative. However, it maintains enough distance from core regime figures to preserve the regime’s plausible deniability of SEA actions. The trend set by the loose connection of the Tiger persona to the pro-Assad media appears not to be an anomaly and continues within examples of other SEA-attributed emails and their context in the Syria Files leaks. For example, the SaQeR.SyRia@gmail.com address left by the SEA on a defaced page of the French embassy in Damascus in 2011 (Information Warfare Monitor/OpenNet Initiative, 2016) appears in the Syria Files as a recipient of further media-style state communication (WikiLeaks, 2012e). When analysing the data collectively within the ACH methodology framework (Annex B), of the five hypothesis tested, the least disproved hypothesis with a score of -11.0 (the hypothesis closest to 0 is considered the least disproved) is that the SEA is informally connected to the Assad regime through inadvertently generated connections. When an alternative to the concept of one-to-one relationships representing power is abandoned, then the SEA’s status within a ‘close enough’ network becomes far more significant. The ‘strength of weak ties’ (Granovetter, 1973) theory would appear to underlie this ‘close enough’ nature of the SEA, as even loosely connected networks can be extremely powerful under certain circumstances. 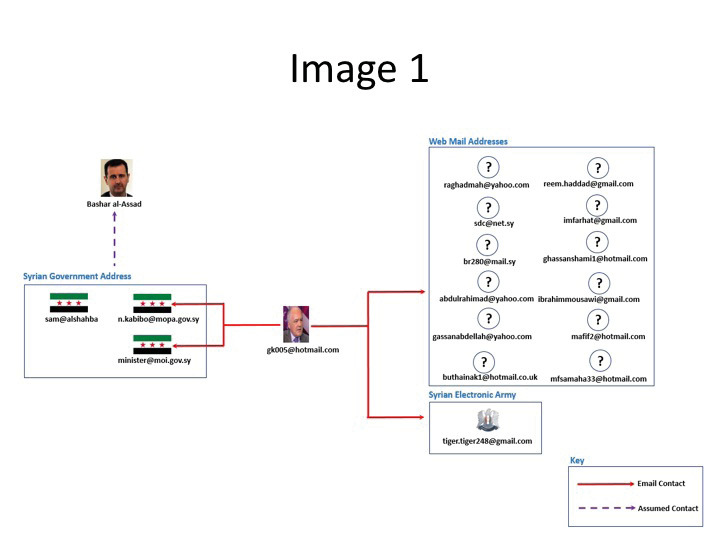 This is practically illustrated through the expansion of the gk005 network shown in Figure 1, with further data drawn from the Syria Files and a previously insignificant email address (new data shown in green in Figure 2 below). The previously unattributed buthainak1@hotmail.co.uk address tracks back to Bouthaina Shaaban (via b.shaaban@mopa.gov.sy). Shaaban is the current most-senior media advisor to Assad and a senior political figure in her own right within the regime. Closer analysis of Shaaban’s emails shows direct contact with senior Western media personalities and political figures, such as Amy Kellogg from Fox News London (WikiLeaks, 2012f) and former UK member of parliament George Galloway (Ravid, 2012). This new data still separates the SEA from Assad and the regime; however, the incorporation of an individual like Shaaban now places members of the SEA in direct contact with a significant regime interlocutor, two degrees of separation from a major regime figure and three degrees from a major, internationally recognised Western political figure. While there is still no evidence of direct contact between Shaaban or Galloway and the SEA, the network fragment depicted in Figure 2 hints at a potentially powerful social network that could be easily leveraged by the Syrian State. It is unknown whether the creation of a ‘close enough’ relationship between the SEA and the Assad state is the result of a deliberate choices by either party, or even whether either group is aware of the dynamics of the relationship. What can be assessed, however, are the benefits the relationship bring for both parties within the SEA-adopted role as a cyber-COIN force for the Assad regime. The distance between the Assad regime and the SEA is obviously appealing from Assad’s perspective, through the classic benefits brought by a state utilizing a proxy force (Mumford, 2013), but the relationship also benefits the SEA. As the group is not technically an official organ of the Assad state, it can engage in activities that would be prohibited were the relationship more formal. An example of this power is the group’s mobilisation of a pan-Arabic diaspora (the most prominent example being the close correlation of the target set pursued by both the SEA and various Iranian hacking groups circa 2011 (Information Warfare Monitor/OpenNet Initiative, 2016). Another example is found in temporary alliances with hacker groups that have vehemently opposed the Assad regime (e.g. the SEA-Anonymous ‘team up’ in 2013 and the joint targeting of the Turkish government networks (Russia Today, 2013)). Additionally, ideological flexibility allows the SEA to present messages with an air of quasi-legitimacy that would appeal to the core Assad opposition — something official organs of the Assad regime could not credibly do. This allows the SEA (and, by default, the Assad regime) to challenge what Rid terms the ‘taboo’ (Rid, 2009) of the COIN force: appearing to give ground on the core issue of the insurgency. The SEA is left free to intimate changes and concessions that could rob the Assad opposition of online support, while the Assad regime retains the ability to later deny any concessions intimated by the SEA due to that lack of a formalised relationship. Through the wider lens of COIN theory, the SEA’s ‘close enough’ nature gives the group the powerful ability to invert aspects of the insurgent/COIN dynamic, such as Rid’s ‘taboo’ factor and a number of the asymmetries between insurgency and COIN observed by Galula (Galula, 1964). Such factors as the COIN force being bound by truth, and anonymity harming the COIN cause, become flexible in the hands of the SEA. Moreover, most importantly for the Assad cause, the SEA inverts Rid’s third summation of Galula’s asymmetries — that “traditionally within the media sphere, the insurgent has the initiative while the counterinsurgent reacts” (Rid et al, 2009; introduction Xi). This is hugely important in a conflict with a significant cyberspace component, owing to the naturally weaker position the state finds itself in within a cyber-insurgency context. As Rid comments, “on balance, the new media environment tends to favour the irregular forces within an insurgency-style conflict.” (Rid et al, 2009: 2) He adds, “the unintended consequences for armed conflict is that non-state insurgencies benefit far more from the new media than do government and counter insurgencies.” (Rid et al, 2009: 14). The ‘close enough’ relationship allows the SEA to challenge these imbalances, regardless of the formality of the relationship it has with the state. Whether the creation of the SEA is the result of a deliberate covert operation on the part of a state organisation or merely a happy coincidence for the regime, the latitude that the Assad regime has undoubtedly given to the SEA has allowed the group to deliver what some have assessed as “the most sophisticated response [from a state] to [the] online activism of the Arab Spring” (Fisher et al, 2011). With such heady praise for the SEA’s achievements, the lack of definition of the true nature of the relationship between the Assad regime and the group is unsatisfactory. This paper has examined the available data on the SEA and the wider digital aspect of the Syrian conflict in an effort to fill this gap. What the researcher found was that the available data neither conclusively connected the Assad regime to the SEA, nor did it equivocally separate them. The final conclusion of the research is that a deterministic piece of data that would resolve this impasse was not found because it does not exist. Moreover, the true nature of the relationship between state and group lies somewhere between the poles of stated-backed and autonomous activist group. Other researchers have observed that the Assad state created an environment for the SEA to succeed (Syrian Freedom, 2012), but it is this paper’s unique contention that this ‘close enough’ connection creates a virtues circle between state and group irrespective of the formality of the relationship. Additionally, the paper highlights the strategic advantages to both parties of a ‘close enough’ relationship within a cyber-COIN context, thus adding much-needed animation to the often theoretically thin concept of cyber-COIN. The future implications for this research are significant, given the pivotal role that cyberspace appears to have played not just in the Syrian conflict and the wider Arab Spring, but in conflicts such as the one currently ongoing in the Ukraine. While researchers are now understanding the role of the cyber insurgent, an examination of the nation state’s response to cyber insurgency is hugely under-addressed within the literature. The need for this study comes from an observation made by Galula (1964) eruditely pointing out, that there is not a single rule set for revolutionary warfare. Instead there is the set of rules and principles that guides the revolutionary, and a separate set that guides the counter-revolutionary and only through understanding both can we hope to understand the details of a conflict. Stewart Bertram is a talented and experienced intelligence and security professional who combines nearly a decade of expertise with relevant academic qualifications. Grounded solidly in a background of computing and social science, Stewart presents a professional customer facing offering, that mixes technical skill with a transparent and easily accessible research methodology. Mumford, A (2013), Proxy Warfare, pages 30–45. Polity. O’Brien, D (2011), Syria’s Assad Gives Tacit OK to Online Attacks on Press, Committee to Protect Journalists, available online as of 2 August 2016 from: https://cpj.org/blog/2011/06/syrias-assad-gives-tacit-ok-to-online-attacks-on-p.php and translated from the original, found at: Al-bab.com, Bashar Al-Assad Speech, available as of 1 June 2016 from: http://www.al-bab.com/arab/docs/syria/bashar_assad_speech_110620.htm (no longer available as of 10 August 2016). Polyanskaya, A, Krivov, A and Lomko, I (2003), Виртуальный Глаз Big Brother (Virtual Eye of the Big Brother), available as of 2 August 2016 from: http://www.vestnik.com/issues/2003/0430/win/polyanskaya_krivov_lomko.htm and translated within: Kiyuna, A and ConyersPage, L (2015), Cyberwarfare Sourcebook, page 276. Lulu.com. Rid, T and Hecker, M (2009), War 2.0: Irregular Warfare in the Information Age. Praeger Publishers.